For the Sonic Adventure level, see Ice Cap. For the Sonic Drift 2 course, see Ice Cap (Sonic Drift 2). IceCap Zone is the fifth zone in Sonic the Hedgehog 3. Sonic and Tails enter from being shot from a cannon (complete with Sonic riding a snowboard), while Knuckles comes in through a teleporter. All characters exit through a small, snow-filled tunnel. 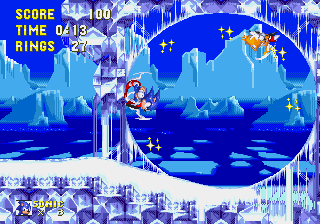 Both Acts contains an outer "snow" area and an inner "cave" area, and uses a background-changing effect to switch between those. The zone is theorized to have been based off of Sonic 2's Hidden Palace Zone, as numerous objects in this level including bushes, bridges, and glowing orbs underground strongly resemble those of Hidden Palace. Penguinator — Blue penguin with holes in its chest. Star Pointer — A black, icy orb-wielding Orbinaut. Sonic and/or Tails can walk over the top of the screen in act 2. By entering and eventually leaving the Bonus Stage at the last checkpoint in Act 1, the background music will be from Act 2. Much like what happens in Angel Island Zone Act 1, this is an internal switch of levels. Tails can break the ice cages, unlike most other objects. If it happens, when Sonic stands on one of them, the game allows Sonic to levitate. Jumping makes Sonic fall down, but the glitch is still there, and combined with a slope, it allows the player to walk through walls and fall through level boundaries (and even return). Sonic and/or Tails can get to Knuckles-only portions of Act 1. In order to do so, the player must hold the Down button on the D-Pad until the screen scrolls down, then stop pressing it and immediately jump and move to the right; due to the Act 1 being looped vertically (the reason why all the slides are endless), the screen will miss the player's position right after jumping, and while it goes the whole way down until it finds your position, you can get through the ice walls that only Knuckles can break. 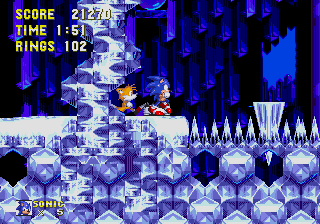 By doing this on Sonic 3 on the first of those ice walls, Super Sonic happens to meet the spiky ice balls, the only in-game objects that can hurt him even in Super-form. (However, in Sonic 3 & Knuckles he's no longer affected by these). The original background music for these levels is taken from the song "Hard Times" by The Jetzons. This song had not actually been released at the time of Sonic 3, and would not be for many years. The band had disbanded years before, but keyboardist for the band, Brad Buxer, was part of the Sonic 3 sound team, and decided to bring (part of) the song out of hiding. At this point, he was a collaborator with Michael Jackson who was also brought on the Sonic 3 sound team. Due to obvious legal issues, the later Sonic & Knuckles Collection replaces all of the wildly different sounding, obviously licensed music (regardless of who was actually responsible), including IceCap, with original songs. It seems at least some of the legal issues were resolved for other rereleases of Sonic 3 such as Sonic Jam, Sonic Mega Collection, and so on. This page was last edited on 8 April 2018, at 07:56.